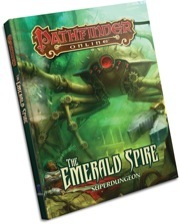 Paizo Publishing, LLC is thrilled to announce today the stellar line-up of the first 12 authors and designers who have been tapped to create their own unique dungeon level for the Emerald Spire Superdungeon. "These folks have been my heroes, my co-workers, and my friends in the industry. They have created the products that have defined my 25 years in this industry and I am extremely proud to have them working with me to create the most amazing Superdungeon ever!" beams Paizo CEO Lisa Stevens. "The very cool thing is how big this dungeon can grow if enough people back this Kickstarter. How low do you want it to go? Back this Kickstarter, and we will find out!" The Emerald Spire Superdungeon includes 32 pages of source material detailing the area around Fort Inevitable, one of the starter towns in Pathfinder Online. It will include at least 12, 8-page dungeon levels, designed by Pathfinder superstars, and an exclusive cover for Kickstarter backers by Pathfinder artist Wayne Reynolds. Additional dungeon levels will continue to be added to the book with each $100K raised over the goal. The Emerald Spire Dungeons Flip-Mat Multi-Pack, a set of Pathfinder Flip-Mats presenting each dungeon level in tabletop miniatures scale, will come with the Superdungeon. The Emerald Spire Superdungeon is currently only available through the Pathfinder Online Kickstarter rewards. When the Kickstarter reaches its $1 million funding goal, the Emerald Spire Superdungeon will encompass 12 dungeon levels in 128 pages, accompanied by 6 double-sided Flip-Mats in the Emerald Spire Dungeons Flip-Mat Multi-Pack. They will be available in PDF format as part of the rewards at and above the $75 "Loremaster" backer level, and in print format as part of the new RPG Print Pack add-on ($100.00). A PDF of Emerald Spire can also be had at the $15 pledge level. Pathfinder Online is a hybrid sandbox/theme park-style MMO where characters explore, develop, find adventure and dominate a wilderness frontier in a land of sword and sorcery. With the success of this Kickstarter, Pathfinder Online is targeted for a mid-2014 Beta. As stretch goals are reached beyond the base funding level, this target date will move up as more resources are brought to bear on getting Pathfinder Online finished. The Pathfinder Online Kickstarter Campaign is in progress and concludes on January 14, 2013. Fans of Pathfinder will help to build the largest official Pathfinder RPG dungeon ever with each fundraising tier met. Exclusive miniatures and RPG Print Pack added to rewards! In celebration of Goblinworks reaching the $200,000 milestone in Kickstarter fundraising for the development of Pathfinder Online, Paizo Publishing unveils today new reward tiers for each additional $50,000 raised. These tiers will add new content to the beloved Pathfinder world by building the Emerald Spire Superdungeon, the largest official Pathfinder dungeon ever published, as well as unleash new miniatures for your tabletop game. The Emerald Spire Superdungeon includes 32 pages of source material detailing the area around Fort Inevitable, one of the starter towns in the Pathfinder Online game. It will also add at least four, 8-page dungeon levels, designed by Pathfinder superstars Richard L. Baker, F. Wesley Schneider, Wolfgang Baur and James L. Sutter. The Superdungeon will be accompanied by the Emerald Spire Dungeons Flip-Mat Multi-Pack, a set of Pathfinder Flip-Mats presenting each dungeon level in tabletop miniatures scale. As the Kickstarter funding grows, so does the Superdungeon. Starting when the $250,000 sub-goal is met, Paizo CEO and Goblinworks COO Lisa Stevens will come out of game design semi-retirement to add an original dungeon level to the book, with new levels by superstar designers announced for each additional $100K raised until the end of the project. By the time the Kickstarter reaches its $1 million funding goal, the Emerald Spire Superdungeon will encompass 12 dungeon levels in 128 pages, accompanied by 6 double-sided Flip-Mats in the Emerald Spire Dungeons Flip-Mat Multi-Pack. As additional stretch goals are met, the Emerald Spire will become even larger, and the number of Flip-Mats will grow. The Emerald Spire Superdungeon and the Emerald Spire Dungeons Flip-Mat Multi-Pack will be available in PDF format as part of the rewards at and above the $75 "Loremaster" backer level, and in print format as part of the new RPG Print Pack add-on. "We're thrilled that Goblinworks has reached a significant milestone in the Pathfinder Online fundraising in just one week," says Lisa Stevens, Paizo CEO. "The passion of Pathfinder fans the world over is what is fueling the project, and the launch of the Emerald Spire Superdungeon couldn't be more exciting. We can't wait to see just how big the Superdungeon will get!" The RPG Print Pack is a new add-on for Kickstarter backers at any reward level, for a pledge of an additional $100 (plus $15 shipping for non-US backers). The RPG Print Pack includes a hardcover print edition of the Emerald Spire Superdungeon, which will feature an exclusive Kickstarter cover by Wayne Reynolds; a print edition of the Emerald Spire Dungeons Flip-Mat Multi-Pack; a print edition of the Pathfinder Tales novel The Crusader Road; and an Emerald Spire Campaign Cards game accessory. The Crusader Road is a Pathfinder Tales novel by New York Times best-selling author Richard L. Baker (Thornkeep). The novel sets up the compelling backstory of the Pathfinder Online game, and introduces key elements of the Crusader Road area of the River Kingdoms, where the online game takes place. Emerald Spire Campaign Cards is a full-color, gorgeously illustrated set of 55 cards containing a variety of Item Cards, Face Cards and Quest Cards to aid in your Emerald Spire Superdungeon campaign. Paizo is also pleased to announce that new WizKids' Pathfinder Battles Miniatures will be added to the Pathfinder Online Kickstarter as rewards for all of the Crowdforger backer levels, which start at $100. The miniatures will all be drawn from the Emerald Spire Superdungeon, starting with the first announced miniature, the Bloodbriar Goblin Raider. A second miniature, the Shadowfire Elemental, will be unlocked when the Kickstarter reaches $300K, with additional miniatures revealed for each $100K raised. This means that starting at $250,000, a new reward will be offered for every $50K raised, alternating between new dungeon levels for the Emerald Spire Superdungeon and new Pathfinder Battles prepainted plastic miniatures. Pathfinder Online is a hybrid sandbox/theme park-style MMO where characters explore, develop, find adventure and dominate a wilderness frontier in a land of sword and sorcery. With the success of this Kickstarter, Pathfinder Online is targeted for a mid-2014 Beta. As stretch goals are reached beyond the base funding level, this target date will move up as more resources are brought to bear on getting Pathfinder Online finished. The Pathfinder Online Kickstarter Campaign is in progress and concludes at 2:00 GMT on January 14, 2013. Goblinworks, Inc. announces today the launch of its second Kickstarter crowd-funding initiative for the development of Pathfinder Online, a next-generation fantasy sandbox Massively Multiplayer Online (MMO) roleplaying game. With Pathfinder Online already in production, Goblinworks seeks to raise $1M for the continued enhancement of the game. Says Ryan Dancey, CEO of Goblinworks, "We are unveiling a process we're calling Crowdforging with this Kickstarter. We are going to engage directly with the community and allow them unprecedented influence on the selection and prioritization of the game's most-desired features. This is a much more intimate process of community development than any MMO has offered in the past." Players involved in the Crowdforging will be heavily engaged with the development of the game, which will be built to suit the community's wishes. To get into the Beta, a player has to become an Early Enrollee by backing the Kickstarter at the $100 level and above. To kick off the Crowdforging, a poll is now live that allows the Pathfinder community to select which player character race option will receive expedited development if the first stretch goal is met. With each Stretch Goal met, a new poll will be revealed. The results of these polls will define the initial feature priorities for the development team. With the success of this Kickstarter, Pathfinder Online is targeted for a late 2014 Beta. As stretch goals are reached beyond the base funding level, this target date will move up as more resources are brought to bear on getting Pathfinder Online finished. Pathfinder Online is a hybrid sandbox/theme park-style MMO where characters explore, develop, find adventure and dominate a wilderness frontier in a land of sword and sorcery. The Pathfinder world is high-fantasy in the tradition of epics like The Lord of the Rings, Conan, the Wheel of Time and Game of Thrones. The Pathfinder setting includes many different classic and modern fantasy elements, from lost cities shrouded in misty jungles to decaying pyramids amidst deserts of burning sands to a fantastic island metropolis where folk from across the world live side by side with all manner of fantastic creatures. The Pathfinder world has a place for any story a player wants to tell. Pathfinder Online's robust trading system puts players in control of the world's economy with player-created items, consumables, fortifications, and settlements. Character-controlled settlements can grow into full-fledged kingdoms that compete for resources as they seek to become the dominant force in the land, raising vast armies to hold their territory against the depredations of monstrous creatures, NPC factions, and other player characters. The Pathfinder Online Kickstarter Campaign begins at 20:00 GMT today, November 27, 2012 and concludes at 2:00 GMT on January 14, 2013. Goblinworks Inc. is proud to announce our first Kickstarter project for the Pathfinder Online MMORPG). The Pathfinder Online Technology Demo Kickstarter will help Goblinworks finance the creation of a Technology Demo that we can use to show investors what Pathfinder Online will look like. Successful funding of this Kickstarter will also demonstrate the community's desire and excitement for Pathfinder Online. In addition to an exclusive long video of the Technology Demo, the main reward for the Kickstarter Project is a 64-page book called Thornkeep. The first 32 pages comprise a Pathfinder Roleplaying Game sourcebook for Thornkeep, one of the three starting locations in the Pathfinder Online MMO. This section is written by veteran RPG designer Rich Baker. The second 32 pages are written by the Goblinworks staff and will provide readers with a behind-the-scenes look at the making of Pathfinder Online. There are a variety of rewards available to backers who pledge from $5 to $5,000, ensuring that there is a reward level suitable for any pocketbook. "With the recent success of Kickstarters funding several computer game projects, our team felt that it was the ideal medium to provide funding for our Pathfinder Online Technology Demo," said Goblinworks CEO Ryan S. Dancey. "Through the success of this Kickstarter, we will be able to prove to the world that there is a pent-up demand for a fantasy sandbox MMO set in the Pathfinder world of Golarion. Our community is our strongest asset, and we plan to show the world just how great the Pathfinder community really is." The Pathfinder Online Technology Demo Kickstarter will run for 30 days, from May 9 to June 8, 2012. Goblinworks has just released the Pathfinder Online Environment Experience! Check out the beginnings of the world of Pathfinder Online through this in-browser application. Sign up to receive email updates about Goblinworks and news about the development of Pathfinder Online! Follow Goblinworks and keep up to date with the latest news. You can find us on Facebook and on Twitter @GoblinworksInc.